This marked route map and mini-guide is meant for skiers and climbers traveling on the Wapta Icefields and in the Bow Summit area in both winter and summer. It was prepared by guidebook writers Mark Klassen and Chic Scott, and cartographer TJ Neault, all of whom are ACMG guides. The Wapta Icefield is well known as both a ski touring and mountaineering destination. It is easily accessible and a variety of trips may be attempted, from one-day adventures to weeklong traverses of the entire icefield. A series of five huts run by the Alpine Club of Canada provide comfortable accommodations for your explorations. Bow Summit refers to the environs around Bow Pass and is one of the most popular ski touring destinations in the Canadian Rockies. Summer climbs of many peaks around Bow Summit are also possible. 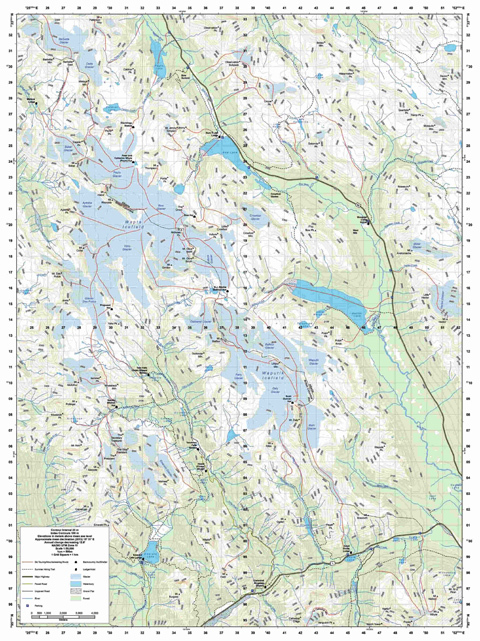 This 1:50,000 scale map has 20 m contours, an up-to-date glacial dataset and is printed on waterproof and tear resistant Yupo paper.